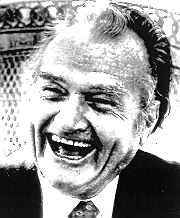 Red Skelton,was born on July 18, 1913 and died Wednesday September 17, 1997 at a hospital in Rancho Mirage, California, after a lingering illness. He was 84. He was a man of many talents. Along with the writing of children's books, needlepoint clowns, composing music, designing china plates, actor and clown, he is now being acclaimed as an important painter. Although his artistry runs the gamut of still lifes, landscapes, etc., clowns seem to be his forte. Red Skelton originals sell from $50,000 up. His works are a sound investment in art, as well as a recognized collector's delight , revealing the man who painted them. His art work has proven its value with other contemporary artists and their worth has no limit. They are intensely moving, winning him the Footprints in the Sands of Time award... one of the highest honors an artist can receive. Critics acclaim them as a whimsical feeling that brightens and cheers every room.